So, I am sewing a scrappy backing and decided on a color scheme of black, white, gray, and red. I grabbed everything from my stash that more or less fit into that color scheme, but I didn't have quite enough. The purpose of this was to use up a large amount of fabric that was getting stagnant, so I didn't want to buy more fabric. I did have a half yard of a fabric that was black, white, gray, and yellow. I'm not sure why I got this fabric--I don't really like it and was probably never going to use it. It seemed perfect for this, except the yellow really stuck out. So, I grabbed a bottle of Pebeo Setacolor fabric paint and just painted red overtop of the yellow. I ironed it to set it, and it's done! 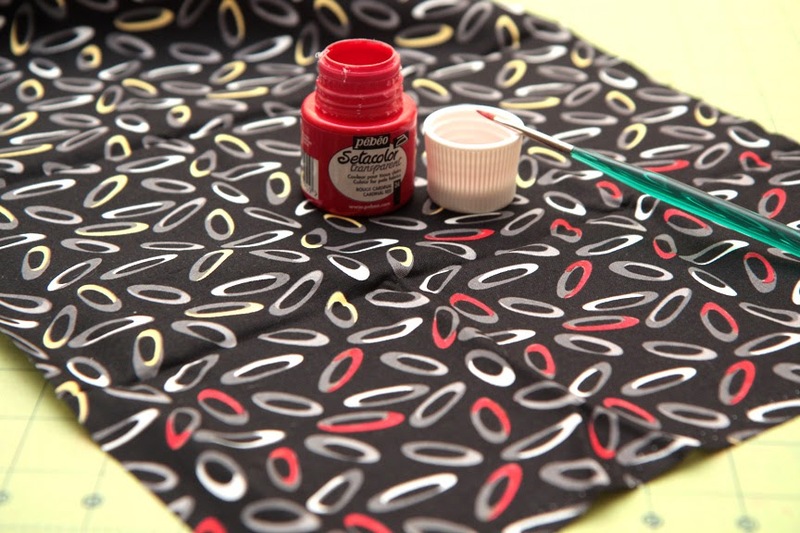 Setacolor is more like a watercolor paint and does not change the hand of the fabric. A half yard took me about an hour to paint. Anyway, I just thought I would post about it because maybe some of you have some fabric lying around that would be perfect if just one or more small things changed color. Before this it had not occurred to me to paint on a print (I originally bought these paints to do art quilts). Love this idea Kristin! How does the cost of the paint compare to purchase a new yard of fabric? I bought mine at Dharma, which cost a little under $4 a bottle. I got red, yellow, blue, black, and white, so I can mix nearly any color (so total cost about $20, or two yards of fabric). I used about a quarter or half teaspoon for this (at most)--for that amount it was around 10-20¢. So definitely cheaper than buying new fabric, especially if I changed a a fabric I was probably never going to use!